We were invited to dinner at Richard Clark and Mary Stec’s to meet Richard’s sister, Berrie (hope the spelling is right). We took an almost full bottle of Napa Cellars Cabernet because we are leaving for a week tomorrow and did not want to waste a very nice wine. Richard was grilling a rack of lamb, and Mary was making a Greek salad, roasted squash and Chinese broccoli. Plus goat cheese and huge gigantic olives for appetizers. Nice. So Richard tells me that a fellow that he works for regularly has given him five cases of wine. All amazing wines – things like Phelps Insignia (early 200’s), Kistler, Caymus – you get the idea. The Napa Cellars (smooth and very very nice) goes quickly. Richard says, go get something from the cases. 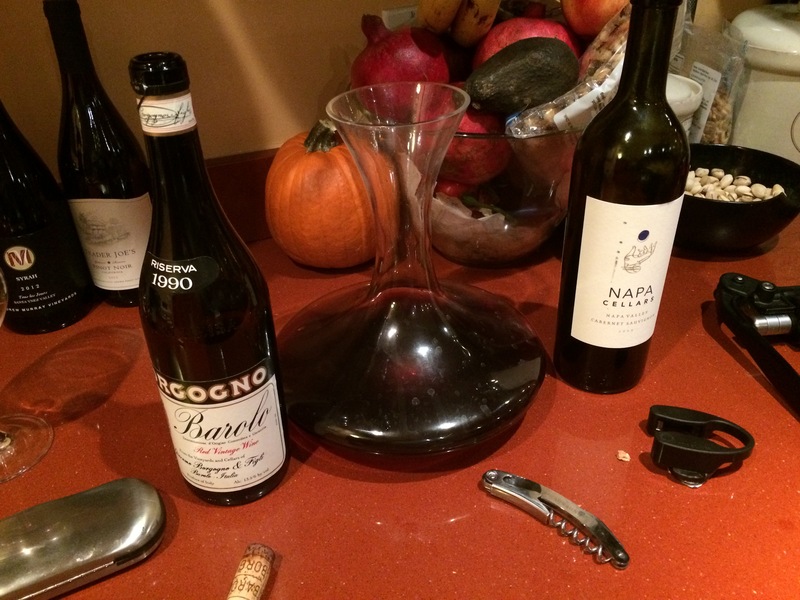 A 1990 Barolo – poured into the decanter to sit a while – it clearly need to open – swirling the decanter a lot. 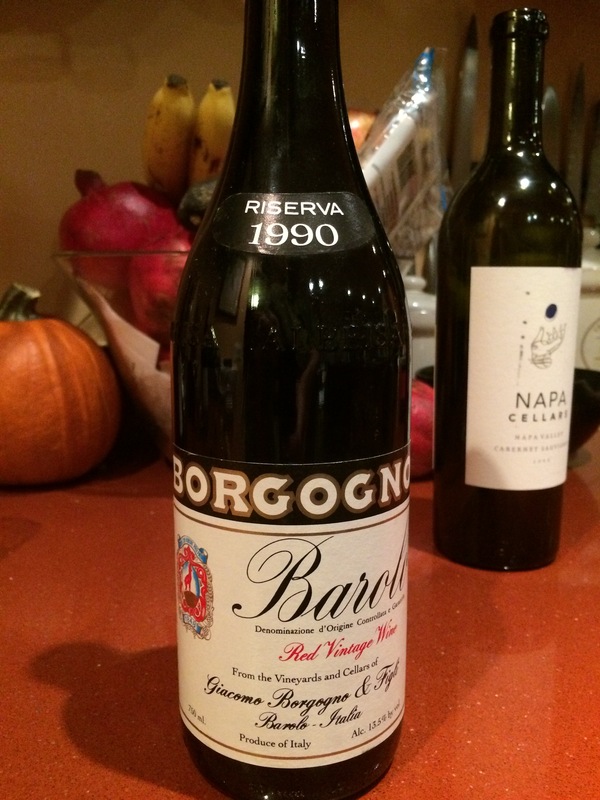 The wine is a 1990 Borgogno Barolo. Very tight right out of the bottle – starts to open a bit after about 20 minutes in the decanter with frequent swirling; a very tightly coiled wine. The wine is pretty close to being over – I would not keep this wine another year. But it could just be this bottle. The nose is very unusual – smoky and something else. So we go online – prices run from $88 to $295 for this vintage. Wow! The wine has an old taste, but there is still the fruit and the balance. But that nose – smoky, leathery, but more than that; tar, flares, like that. Interesting. A great dinner and some great wine. Can’t wait to get into those other cases!